"These pancakes were a regular feature on Sunday mornings when I was growing up. They're still the best I've ever had. 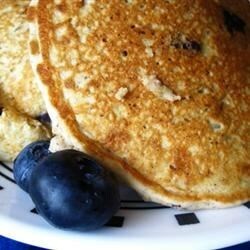 Buttermilk pancakes with oatmeal and blueberries." In a large mixing bowl, mix together oats, flour, sugar, salt, baking soda and baking powder. Stir in eggs and buttermilk. Fold in blueberries. Pour or spoon the batter onto the griddle, using approximately 1/4 cup for each pancake. Brown on both sides and serve hot. Hmmm. Maybe I did something wrong but they were too thin and I had to add extra flour. They were a bit doughy. Far too much milk, batter was soupy.